Electron Microscopy reconstruction of the yeast vacuolar ATPase. 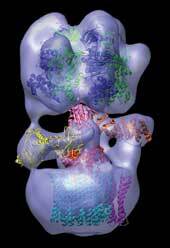 Ribbon models for individual protein subunits have been fit to the electron density. From the lab of Stephan Wilkens, PhD.